Artist Eunsu Kang currently has a solo exhibition, FACE, that features collaborative projects using Machine Learning methods. The exhibition invites you to meet faces that are familiar yet have never existed. The co-creator of the featured portraits is a group of Machine Learning neural networks. 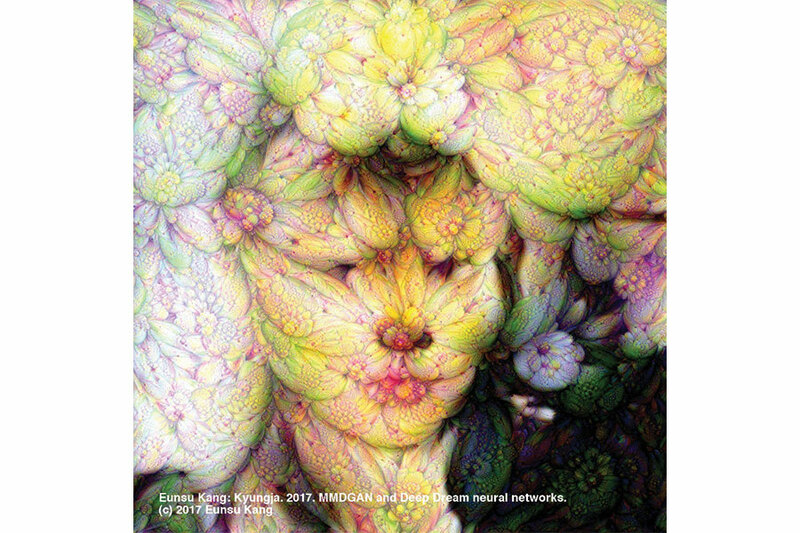 These artworks are generated by the MMDGAN (Maximum Mean Discrepancy Generative Adversarial Network) developed by Chun-Liang Li, Wei-Cheng Chang, Yu Cheng, Yiming Yang, and Barnabas Poczos. This Artificial Intelligence (A.I.) studied 200,000 human faces and then generated new faces as if a child learns what a human is from many encounters and draws an imaginary friend. The generated faces by this bias-free co-creator have been gorgeously diverse and intriguingly unique. Its own style of painting strokes and color schemes have also emerged. For this series, Kang focuses on ambiguity. The ambiguity is what makes an “artwork” art by allowing multifaceted reflection of the visitors’ gaze. Visitors are also invited to an interactive installation where they can “weave” voices by turning an invisible spinning wheel and thus hear the interviewee’s life stories. The exhibition is on view at the Judith Rae Solomon Gallery at Youngstown State University, Ohio from September 11 – 29. On September 21, Eunsu Kang will give an artist talk at 4:00pm, which will be followed by a reception for the exhibition from 5:30-7:30pm. Visit the FACE Exhibition Website for more details.